Recently we were hanging out with a group of married friends when it dawned on me that Daddy and I were the old-marrieds of the bunch. Everyone else had been married two years or less…and here we are fast-approaching our 5th anniversary. What the what??? I’m realizing more lately how quickly Daddy and I really did have kids. Sure, we’d been married two years before Miles came along, but here we are five years and two kids into marriage, when some of our friends have been married five years and are still [purposefully] waiting. My Instagram feed seems chock-full of childless married couples going on grand adventures together and living nomadic lifestyles. Meanwhile, my personal Instagram feed is exploding with pictures of the cutest little chubby faces you’ve ever seen (yes, I’m biased). And in case you didn’t get that, Little Munchkins, that would be you. In all seriousness though, you all are the greatest, most fulfilling adventure I’ve ever been on…or probably ever will go on. No, I don’t spend my days scaling mountains or living out of a station wagon, but my days are still incredibly rewarding. We really try to keep traveling and going on spontaneous adventures with you little crazies in tow (#babywearing or #carrythemwithyou anyone???). We throw in our fair share of crazy. Think: flying cross-country with a two-year-old and an 8 week old, flying alone with a 23-month “lap” baby and an ever decreasing preggo lap, camping big and pregnant, camping with an 11-month old, or hiking with two kids on our back. Yet, even on the days when I’m just home with you all day there are still challenges to overcome and new adventures to be had. Although it may seem like it sometimes, being a wife and mom is not mundane. It’s an adventure that’s not for the faint of heart. It’s gritty and raw and revealing and strengthening all at the same time. It’s one of the hardest and best things you’ll ever do. Some days as parents, Daddy and I thrive. Others, we just barely survive. Yet, I know we wouldn’t trade the adventure of parenthood for a billion solo adventures out in the world. Andy, Miles, and Nora, you are my greatest adventure. We went on a much needed vacation in June. I had the best intentions of posting a slew of pictures. As usual, however, life got in the way. So…I decided I’d share with you some Instagram pictures of our trip. Be sure and follow me (@thelifenotmyown). I love making new Instagram friends! Well, my sweet little man is a whole year old. I still have to pinch myself when I say that. It just doesn’t seem real. There are days that it doesn’t even seem real that I am a mama…that I have a son. I never thought I’d have a son that would look so much like me. I mean, he looks like a little boy—and he certainly acts like one—but his face, his build, his head, even many of his looks are so very like me. It seems fitting, really, that this little man child that came from my womb would be such a mirror for me. It makes me think of the flaws I have that I don’t want to pass on to him. It makes me worry that I will never know how to parent such a child. I certainly would never have known how to parent myself. Add to that the fact that he is very definitively all-boy, and I feel utterly lost and helpless. Thankfully, my God is not. Daily I pray and ask God for wisdom. I ask Him to show me how to raise up this little man right. I ask Him to show me how to best lead him on the path God has for him. I don’t have all the answers. Heck, I don’t have any of the answers. But that’s okay. My loving, gracious, amazing God does. And that’s all I need to know. Last Christmas my mother gave me an apron she had made. It was feminine, frilly, and embodied the carefree days of summer. Bright greens and pinks, with cherries, watermelons, and lemons, it was just what I needed for my drab kitchen…especially in the grey days of winter. It embodies everything I love about the kitchen—a feminine woman making good food for her family and delighting in her God-given place. When I was little, my mom had a drawer full of aprons. When helping her bake cookies or other treats, we got to select one out of there. But there was one that was always Mom’s. It was a white, lacy piece that was long—perfect for my tall mother. She always wore it while she cooked and baked, whipping up something delightful for us to eat. Many are the hours my mom has spent in her kitchen. Us girls rarely ever helped with meals, simply because my mom was so good at it. When she was bending over her stove, wearing that white apron, she was in her glory. We would watch her with wide, wondering eyes, hoping to someday be the cook in our kitchen like she was in hers. And as she worked, she’d tell us stories about the women who came before. She’d talk about what my grandma used to make, and my great-grandma’s famous “Polish Balls”. She’d tell us about the persimmon tree in my great-grandma’s backyard, and all of the persimmon recipes she subsequently collected. Every fall she’d get out her grandma’s apple pie recipe, the crust of which always won the prize. At Thanksgiving she’d make a huge feast, probably with the same dishes my grandma used to make. At Christmastime we’d make the “Polish Balls”, and send a batch off to everyone who loved my great-grandma’s delicacies. And always she was wearing that apron. One time I tried it on, just for fun. But, somehow, it just didn’t seem to fit. It wasn’t mine, it was Mom’s. It reminded me that my grandma and my great-grandma probably had their own aprons that were distinctly theirs. And here I am, a married woman, with a kitchen of my own. And an apron of my own. What will this apron become to the children I will bear? I pray it becomes a symbol of “mama”, just like the white apron was a symbol of my mom. A symbol whose floured sides and worn straps are full of love and care. Full of the stories of the women before. Full of good food, a pretty woman, and family. 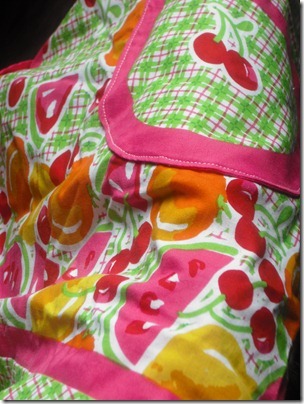 This post was written as part of Apron Week over at The Little Pink House. Head over there to check it out!